Our oils are 100% Therapeutic Pure Essential Oils for use in Therapeutic Aromatherapy Applications. (They are Free from Pesticides and Herbicides as tested by GC/ MS. Some are ECOCERT - Certified Organic). Our Essential oils are offered in a variety of sizes to fit any budget. Please order Small sizes if you are unsure if you will like the oil. 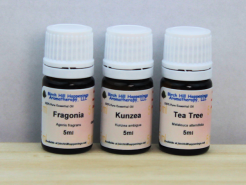 Please Select an Alphabetical Category below to see each Essential oil or Absolute we offer. We sell over 110 different Essential oils and Absolutes. Please select a Category above to explore our offerings. For the beginner,start with 2-3 oils first, get to "know" them before adding more. As you continue to study and learn about essential oils you will naturally become more familiar with all the properties each oil has whether it be for physical, emotional or spiritual support. Many oils have similar properties from anti-fungal, anti-bacterial, anti-septic to helping you to relax, calm down, or become alert and energized. Exploring the wonderful benefits of essential oils begin with the first few oils you buy.